* Note: Delphi 3 and Windows 95-NT are supported only by EurekaLog 4-6. 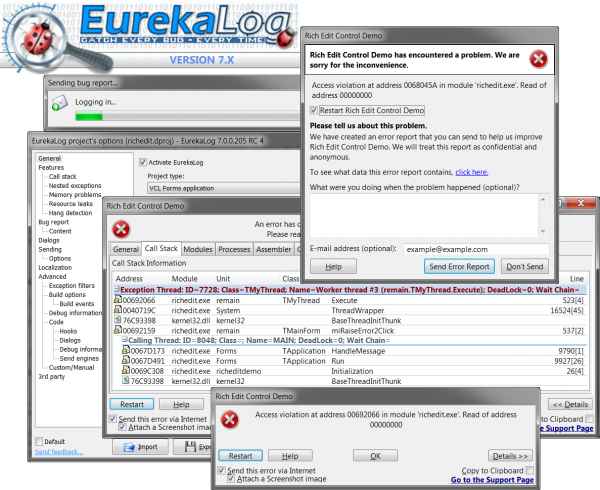 EurekaLog 7 is the current and most recent version of EurekaLog. With EurekaLog, you also get free access to licenses for older versions: EurekaLog 4, EurekaLog 5, and EurekaLog 6. Download links to installers of earlier versions will be available in your control panel after purchase. Please note that old versions are no longer developed nor supported. They are provided only for backward compatibility purposes. You can use them, if you need support old systems (Delphi 3, Windows 95, Windows 98, Windows ME, Windows NT). 10)..Fixed: "Cannot locate menu item 'HelpThirdPartyMenuItem'"